What Can You Fit In A Trading Laptop for Travel? It’s no secret that laptops don’t offer the same level of power and speed that you’re desktop trading computer delivers you. I get lots of questions from my clients about how to pack the power of their desktop into a laptop while they’re on the go. If I had my way I would drive my Corvette everywhere. It’s powerful and fun to drive. It’s a totally different experience of driving. Unfortunately, it isn’t always possible. You can’t load a group of people in to a Corvette. Much to my disappointment when the occasion calls for it I have to drive my SUV. My desktop computer is a corvette. I wish I could shove that thing in my suitcase when I travel. Nothing compares to the power and speed it delivers. You want a Corvette when you’re on the road (but you can’t exactly pack your desktop computer into your briefcase). As traders, how do we pack all that power into a machine that is portable? The simple answer is that you need the right hardware. What Is A Trading Laptop? First, we need to clear something up. A laptop purchased from a big box store is not a trading laptop. It’s deceiving – I know. It boils down to what the hardware is capable of doing not how you’re using the laptop. Just because you use the laptop for trading doesn’t make it a computer optimized and designed for trading. A trading laptop computer is a laptop specifically built with specs that are designed to use trading software & trading platforms. This means that the laptop has been built and thoroughly tested specific to the use of these types of software and data loads. I have spent years trying to figure out what is the best laptop for trading. Don’t dismiss how important a trading laptop is too quickly. For those of you who travel and trade, you know how essential this is. When you are traveling, you need to be able to easily set up and work for a limited amount of time. Nothing…nothing is worse then thinking you are going to hop on your laptop and set up a few trades, just to have computer problems and connectivity issues dropped in your lap. Traveling can be hectic. You don’t need any other stress in your travels, let alone in your trading. A decent trading laptop is crucial. I am telling you this from painful experiences of learning this the hard way. Which Laptop Is Right For Me? Okay. Now that we are on the same page about what defines a trading laptop, I have a couple good laptop guidelines for you to follow in order to find the laptop that fits for you. #1 How Big and How Heavy? – I find that one of the first questions I get when I talk to clients about laptops is what size laptop they need. Let’s face it, if you travel often or take your computer to your office, the size and weight of the computer matters. The crux of this question is not only weight, but screen size. If you are particular about needing screen space and don’t want to carry portable screens; go for the 17” size. However, if you want something lighter weight a 13” might be better suited for you. #2 Processor – You need an i7 processor. I install i7’s on all my computers be it desktop or laptop. This is necessary to handle the real time data and trading software systems. #3 RAM (Memory) – You will also need a decent amount of RAM. 8GB is the minimum for traders, but if you tend to use multiple platforms or several pieces of software at the same time you should upgrade to 16GB. #4 Hard Drive – SSD hard drives are essential for trading computers. You will need to decide how much room you need on that drive. Typically they come in 250GB or 500GB. However, if you are just in need of data storage – just get a traditional backup drive. You don’t need to pay the premium for a large SSD drive. Here’s what I don’t want to happen. I don’t want any more calls from customers who have experienced a huge loss from trading on an outdated and underpowered computer while they were traveling. Honestly guys, I hear it too often. It’s not worth a 10 grand loss to avoid spending a couple thousand on the laptop. Besides, a good machine will last you for up to five years. Of course we all want to trade profitably. 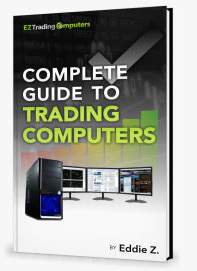 A good computer is part of profitable trading. You should have the hardware necessary without overspending on components that don’t offer you an advantage. This is why I started EZ Trading Computers. I am advising you as a fellow trader; if you don’t have a great laptop to travel with I highly suggest looking into options that give you the power and the sustainability that you need when you are away from your home office.